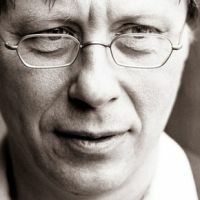 Music, always inhospitable to ekphrasis or literary description, seems doubly so when it’s not even typically ‘musical’, which the sound-worlds of the contemporary Austrian composer Georg Friedrich Haas are not. How to capture the ways this weird sonic world emerges almost organically, ex nihilo, like life itself, mutating, growing, pulsing, speeding up, slowing down, or coming suddenly to a stop. These are soundscapes on a vast scale: gigantic rotating planets, slowly warping architectonics, shimmering stillnesses glowing like the aurora borealis. This microtonal music (also referred to as ‘spectral’) finds its forerunner in the micropolyphonic world of the Hungarian composer György Ligeti, the eerie sonic hovering between tones of Atmosphères which Kubrick memorably heard as harmonia mundi, the Music of the Spheres, in 2001: A Space Odyssey. Here are those ‘black seas of infinity’, the ‘terrifying vistas of reality’, depicted in sublime slabs of abstract sonic pulses. The shards of pseudo-melody which occasionally emerge seem even weirder when they do. It puts me in mind of the new philosophical school of the Object-Oriented: perhaps Haas is composing sonic hyperobjects, or preparing us for the post-human world. Screen-grab from Stanley Kubrick’s 2001: A Space Odyssey © Warner Bros. Entertainment Inc. Does the word ‘music’ even apply here? Does it even matter? This will be noise to most, as it would have been to me but a few months ago, when I was all Bach and Beethoven, Mahler and Shostakovich, and this would have irked me into violent vocal derision. But then something clicked and its almost drone-like emergence, continuation, disappearance, anti-melodic swells of sound, pure, impure, but not noise (whatever that is), and not irksome. It now chimes offering a sort of mental consolation for the fuzzy logic of the world, a counterfoil to modern life’s dissonant overload. To quote Kafka in his Diaries, it bears me out like a friend.